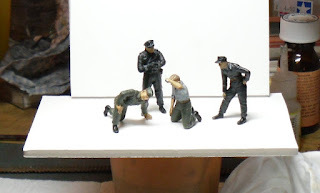 I have finished the ICM figures. It needed a bit of investigation but I think that I have the colours and marking right. They make a nice little group. The base is a piece of foam board which I have coated with some Vallejo Pumice spread. This is a gritty concoction that you spread on and let dry it dries to a nice textured finish. I expect to spray it with an earth colour and then liberally cover it in MIG Pigment - Russian Earth and get some light grass down. I have pressed the vinyl tracks into the surface to get some track marks. However, whilst taking the photos I forgot it was there and put the camera face down onto it. My camera lens cover is now stuck open! I managed to get the gritty pumice off the rest of it and I am hoping that the lens door will clear in time. I have made a small cover for the camera out of some chamois leather so having the lens open isn't a real problem. Ho hum! I have made an easy way for you to access the blog. Note that there is also a blog counter in the top right hand corner. This is the number of accesses since 13th of September 2009. 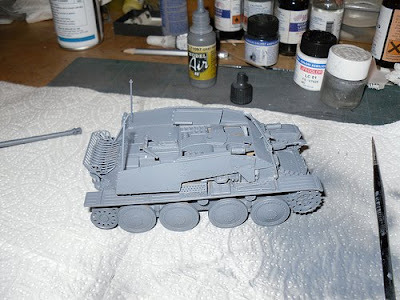 Here is a picture of the Marder having been weathered somewhat, with the track on the left hand side. As you can see, the track sags nicely along the top rollers. Just what I wanted. If you look carefully in the saucer in the background, you will see the two tarp supports from the rear of the fighting compartment. One broke off and I had trouble fitting the track so I broke the other one off. I thought - as I have to sort one out then two can't be that different! 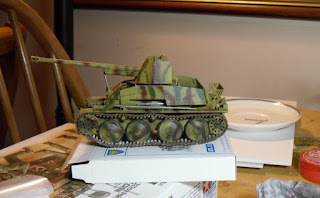 Well t only took a week of evenings and a lot of Monday but I have finally managed 96 links on each side which I think will be sufficient for the diorama. Here is the completed pair. and this is why I wanted to make them. See how they are so much more flexible than vinyl tracks! So it hasn't been as bad as I thought!. I have one side made already. Of course, I have found out some things I can skip and some tricks. 4. Set a drop of super glue on the end. I then put 2s into 4s and so on to make the full run. All of a sudden, it's running much quicker. 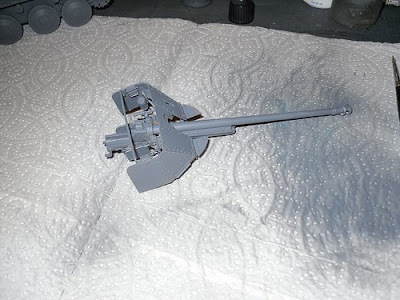 Here is the first side presented along with the vinyl tracks so you can see why I am bothering. As usual, click on the image for a high resolution version. Off I go to make the next one - grin. 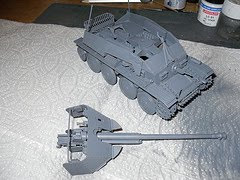 I am making the Marder and placing it on a diorama that will incorporate the maintenance crew that comes with the kit. However, I want to do it with a dropped track and I can't do that with the vinyl tracks that come with the kit. First off the dropped end won't lay properly and also the part left on the rollers won't sag as it should. 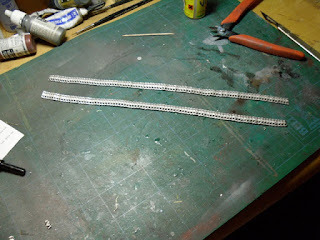 So I have got a set of FriulModel white metal tracks. Now if you have never used these, what you get is a pile (210 in this case) of individual white metal track links and a roll of thin wire. Step 4. 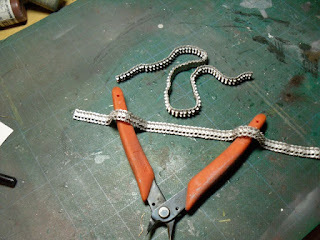 Cut each length of wire to length (210 operations). I make this 1050 individual actions, assuming no fumbling, dropping etc. Will I do this again? Maybe not! 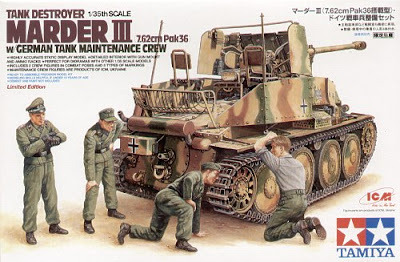 BTW, I notice from the photo that one of the rear tarp supports on the Marder has got broken. Yet another little problem - smile. I had to steel myself to attempt a free hand three colour camo for this. I have now done it and have started picking out the details. (as usual, you can click on the picture to see a larger image). Maybe looking at the larger image isn't a good idea. I now see where I have some paint filling in and touching up to do!